BOOSTING the country's kangaroo meat export market has the potential to solve both primary production and animal welfare issues in south-west Queensland, according to Federal Member for Maranoa Bruce Scott. With drought conditions continuing to ravage much of the state, farmers are losing an ever-increasing amount of pasture as the hungry macropods - which are in plague proportions - search for sustenance. Sadly, innumerable kangaroos are also being critically injured or killed by vehicles as the pasture runs out and they are forced to forage for grass on the roadside. 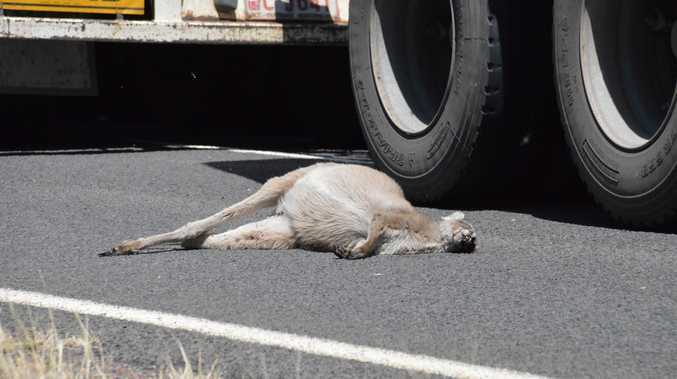 Along a 25-kilometre stretch of the Mitchell Highway on Saturday, the Western Times counted more than 200 kangaroo carcasses in varying states of decay. Despite temporary issues over the past 12 months on kangaroo meat exports to Russia by Australia's sole authorised supplier, Adelaide-based Macro Meats, Mr Scott said he believed the Federal Government needed to look at using export markets as a long-term solution to the kangaroo problem. "We've got to see the kangaroos as a resource that can create economies for our western Queensland towns," he said. "I'm working with our new Trade Minister…and it's going to be an important part of the trade negotiations with Korea, China and Japan (to) see if we can't get more market access, or get market access initially, for kangaroo meat into those markets." Mr Scott said he empathised with farmers who were losing significant income from the devastating effects of current kangaroo numbers, a sentiment echoed by the newly-appointed Agriculture Minister, Barnaby Joyce. In what is being seen as a positive for rural Australia, Mr Joyce has already met with representatives from the Kangaroo Industry Association of Australia to discuss revitalising the kangaroo meat export market and he said he understood how the animals could impact primary producers. Prior to relocating to New South Wales to contest the seat of New England, the then-senator was based in St George. Mr Joyce said in a statement he had personally seen the impacts the collapse of the international trade had on crops due to increasing numbers of kangaroos across the region. "I recognise the impact the ban on trade in kangaroo meat has had on rural and regional Australia," he said. "This impact has not only been felt in economic terms; it has also caused social difficulties for rural and regional communities." While animal welfare groups and opponents to kangaroo harvesting have slammed the practice as inhumane, Mr Scott went on the offensive and asked how humane it was to let "hundreds and hundreds" of them die due to drought conditions. "I think those who talk about Skippy and all of that are just sensationalising, wanting to get a very cheap run (in the media) somewhere," he said angrily. "I can take them to places of the past where...as the waterholes dry back and the dams dry up, you can go there and see hundreds and hundreds of them dying in the waterhole. "Is that good animal welfare because of the sheer numbers of them? "We've got to be smart about this; we've got to manage the numbers." Macro Meats managing director Ray Borda did not respond to inquiries from the Western Times. Will increasing kangaroo meat exports solve both animal welfare and primary production concerns? This poll ended on 14 October 2014.